OsciPrime is an Open Source Android high speed data acquisition hardware platform and Android oscilloscope application. All layers of the project - from hardware, to firmware, up to software - are well documented in great detail. Using USB, the hardware plugs into Android devices that support USB Host. Together with the OsciPrime Android oscilloscope application it turns a tablet or mobile phone into a high speed data acquisition system. The project was initiated at the University of Applied Sciences Northwestern Switzerland in 2010, where it has been awarded the price for best bachelor thesis of the technical faculty. Since then it has been further developed and maintained by Nexus-Computing Switzerland where the creators work as engineers. The OsciPrime Android software demonstrates how to work with high data throughput and shows how to favour the Java Native Interface for sample processing. The OsciPrime Android application can be easily extended with custom features. By making the project's hardware available for purchase we are answering the requests of many who wanted to try out the oscilloscope. The OsciPrime hardware runs out of the box with Android. The hardware consists of two parts: the analogue front-end where a signal is tapped and adjusted for the A/D conerters and a digital front-end where the data is quantified and prepared for USB transmission. 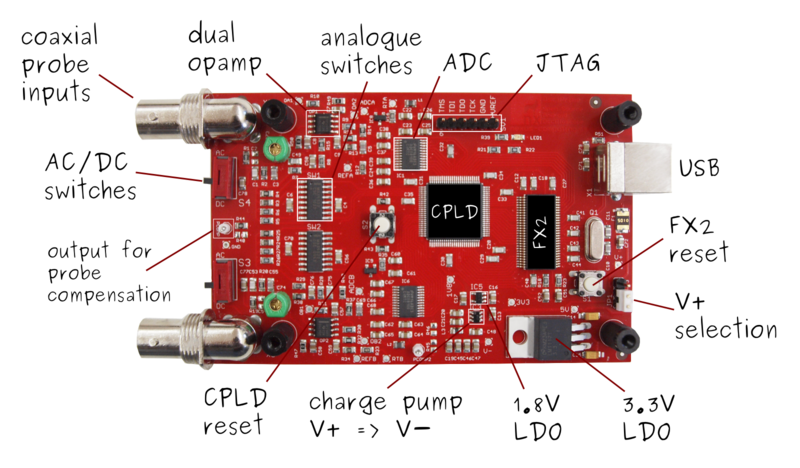 Key components are a Xilinx Coolrunner CPLD and a Cypress FX2 microcontroller. Simplified schematic of the hardware displaying analogue and digital front-end.